I never get tired of repeating this. Salento, Colombia was one of the highlights of our South America trip. The verdant valleys, long walks, the day trip to an eco farm and the warm hospitality of the La Serrana hostel are enough to make any traveler happy. 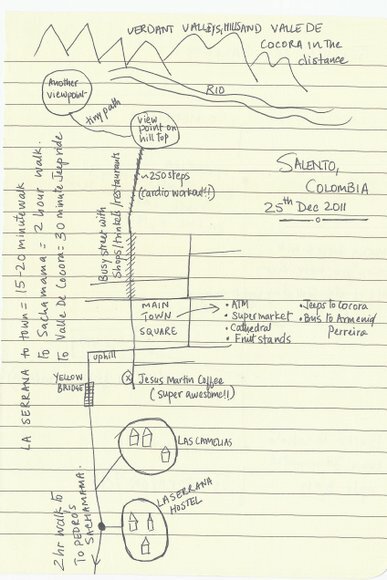 Here are a few drawings that I drew showing what is where in Salento, Colombia. 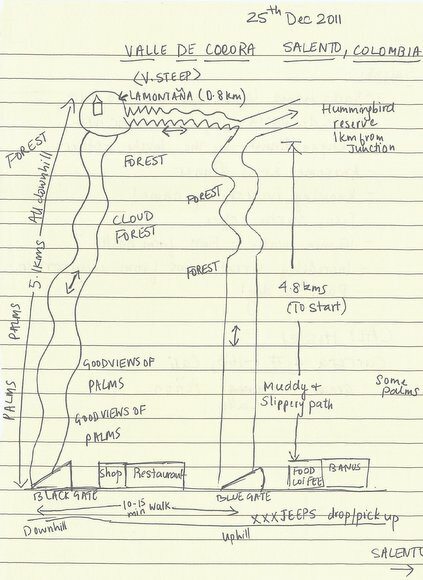 I love drawing little maps in my notebook. 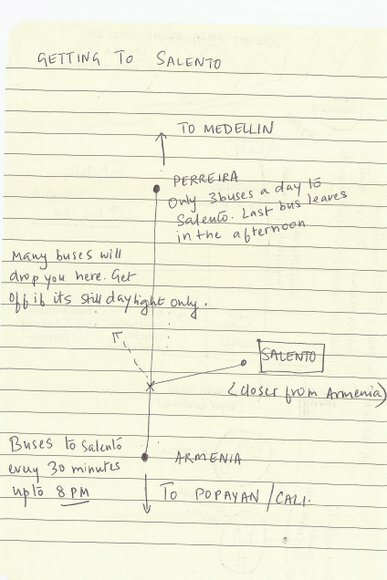 Here is how to get to Salento. Its not exactly on the main road or a routine stop with plenty of buses going to it. Its tucked away and we have heard stories of robberies in that stretch. Best way to get here: take the bus to Armenia (get there before 8 PM) and take a mini bus to Salento. You could get off at the midway point shown below, but only if you are in a group and its daylight. A little map of Salento. The viewpoint on the top of the hill is really pretty and has a swing! Jesus Martin coffee is not to be missed too. If you are only interested in a good view of the palms and not a long hike, the follow the road from where the jeep drops you for another 10 minutes and turn into the black gate on the right. A bit further you will find excellent views for photos. Walk however long you want and return. The rest of the hike is quite beautiful, but the wax palms are only visible towards the end.